When you need a nourishing pick me up that won’t cause your cortisol levels to spike (the way caffeine does! ), try this mind and mood soothing tonic. It combines some cortisol balancing adaptogens along with the perfect spice blend for a drink that’s part chai, part smoothie. I like to sip on it when I want to stay relaxed, focused, and jitter-free! And okay, if you really want your coffee in the morning, you can do the “dirty” version (then I guess this recipe becomes the Dirty Mind Tonic) with the “bonus tip” I give you below. Turmeric is a true goldmine (doesn’t its color tell all!) of benefits, especially for women. You might be familiar with its anti-inflammatory action, but turmeric is beneficial for alleviating symptoms of depression, lowering Hashimoto’s thyroiditis antibodies, reversing local tissue damage from endometriosis, and enhancing breast health..
Ashwagandha is one of my favorite adaptogens. It has been shown to improve cortisol levels by resetting adrenal-associated stress, and in doing so improves sleep and reduces anxiety. I also recommend ashwagandha to heal deep exhaustion and improve memory. The adaptogenic medicinal mushroom reishi helps support the adrenal glands, too. I think of it as the mushroom to use when you’re stressed out and run down. Reishi also helps support the body’s natural abilities to detoxify from environmental exposures, boosts immunity, and calms the nervous system. Cardamom and cinnamon are warming, aromatic spices that enhance digestion and metabolism. Ready to give this a whirl? Here’s my recipe. Enjoy! Place all these ingredients into a blender or Vita Mix. Blend until smooth. 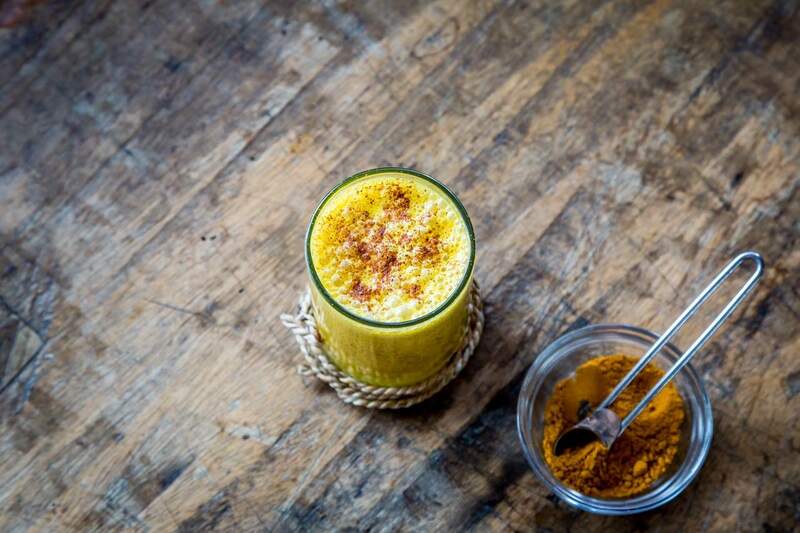 Pour into your favorite mug (optionally ‘dust’ with a pinch of cinnamon to make it so so pretty) and enjoy this anti-inflammatory, mind & mood soothing, cortisol balancing drink. You can also try this iced! Simply skip heating the milk, and serve on ice or blend with 1 cup of ice (then it also makes more!). Bonus tip: To make it “dirty,” do half of the amount of coconut or almond milk, and sub in ½ a cup of coffee – cold or warm depending on whether this is a hot or iced beverage – before you blend.